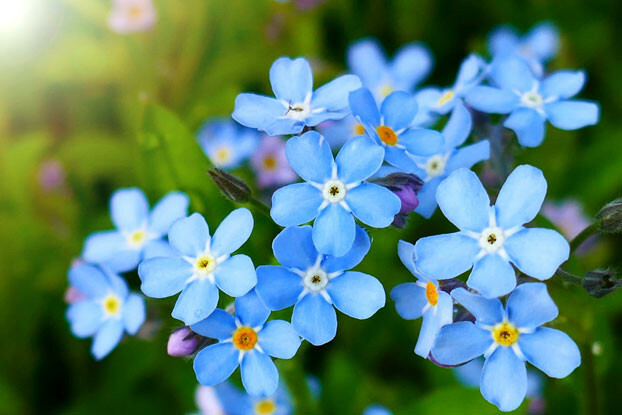 "Also known as the wood forget-me-not, this introduced perennial is rich in symbolism and folklore. It can grow up to a foot and a half tall and is topped with clusters of sky blue to purplish flowers that bloom from spring to summer. Prefers full sun or part shade with rich, well-draining soils. Makes an excellent choice for mass plantings, borders, or containers. Can be an aggressive spreader in some situations but is easily controlled. Scientific Name: Myosotis sylvatica "
Also known as the wood forget-me-not, this introduced perennial is rich in symbolism and folklore. It can grow up to a foot and a half tall and is topped with clusters of sky blue to purplish flowers that bloom from spring to summer. Prefers full sun or part shade with rich, well-draining soils. Makes an excellent choice for mass plantings, borders, or containers. Can be an aggressive spreader in some situations but is easily controlled.